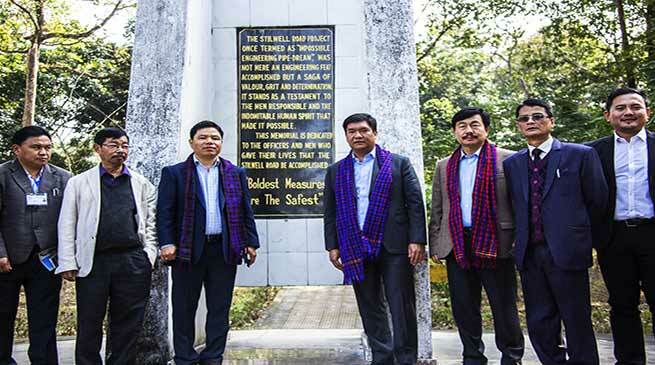 Chief Minister Pema Khandu today inaugurated the World War II Memorial Museum in presence of Education Minister Honchun Ngandam, State BJP President Tapir Gao, Parliamentary Secretaries Laisam Simai, Tesam Pongte and Tage Taki and Kanubari MLA Gabriel Wangsu. The museum is built through funding from Union Ministry of Culture for Rs 2.25 crores and executed by PWD. The Chief Minister visited the war memorial where remnants of the war, personal belongings of the soldiers and other persons involved were preserved collected from the locals. The museum also showcased traditional items from local Tangsa community. The Chief Minister was informed that about 833 graves including mass graves have been discovered. Also the graves include people who were involved in manual work in construction of Stilwell Road. Troops of Assam Rifles first spotted the cemetery in 1997, according to Museum officials here. The Chief Minister in his interaction with local leaders and officials said the cemetery has great potential to attract tourists if developed properly. He assured support of the state government for preservation and promotion of the war cemetery. The Chief Minister later took a walk around the ware cemetery where hundreds of graves lay.